Tentative plans show a new greenhouse being built on the rooftop of the third floor of Bush. 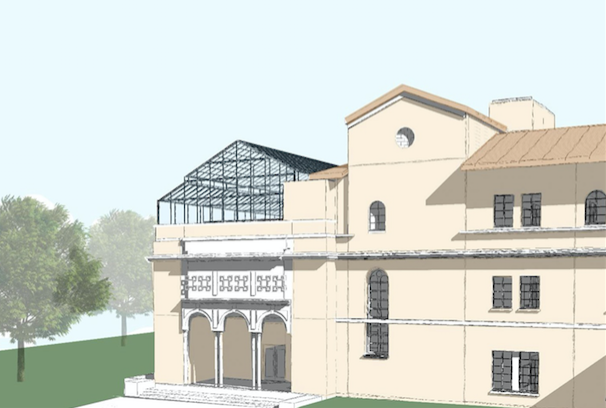 The Rollins greenhouse will relocate to the rooftop of the Archibald Granville Bush Science Center’s third floor to make way for the construction of the new lakeside residential hall. A completely new greenhouse will be constructed starting in April 2019. It will reduce the size of the greenhouse from 2,700 square feet to 2,500 square feet. Alan Chryst, the greenhouse manager, said that he believes the move will be completed before May. This was confirmed by Scott Bitikofer, assistant vice president of facilities services. According to Chryst, the greenhouse atop Bush will be split into three zones: faculty research, student research, and teaching collection, which includes the plants that are out on display. There will also be a headhouse with the potting and storage area. Because of the faculty and student research zones taking up so much space in the greenhouse, the teaching collection will have to be greatly reduced. At the moment, Chryst does not know what will become of the plants that can no longer be housed, but he said that he is currently working on a solution. Dr. Paul Stephenson, associate professor of biology, is glad that the greenhouse will now be so close. He said that its increased accessibility will make conducting plant experiments easier for students. He was also excited that different rooms can be adjusted for light, temperature, and humidity, which would allow for designing experiments that require those kinds of changes. Bitikofer said that many research greenhouses have this feature, so it is great that Rollins now has it, too. Although Stephenson is excited about these developments, he expressed concern about how many plants the greenhouse will lose as a result of the move. He also expressed concern over whether having it on the roof will cause water leaks on the lower levels of the building. Bitikofer believed the leaking concern is valid, but it is an issue that can be easily managed. In its current state, Bush has much of the mechanical equipment already on the third floor roof, and there has not yet been an issue. Stephenson claimed that construction may make the building a little noisy at times and that the west entrance of the Bush building may be affected, but he does not anticipate any serious classroom interruptions during the move. Bitikofer responded by saying that all construction has the potential to create these kinds of disruptions, but that they will try to curtail the noise as much as possible.